As our nation commemorates Memorial Day this month, consider visiting the Grant County Veterans Memorial Park at Sheridan. The memorial site honors the nine airmen whose Boeing B-17F Flying Fortress crashed in Sheridan in 1943 and is located at the crash site of the World War II bomber. 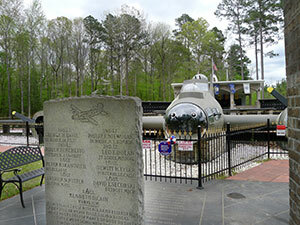 The park’s centerpiece is a life size B-17 replica. As to the history of the plane, it was part of a squadron based in Smoky Hill Air Field in Salina, Kan. They had been assigned to head to Florida, and then Europe, to help fight in the war. The plane was held back due to mechanical problems and was eventually condemned for flight. But it was sent out to Florida anyway to catch up with its squadron. Enroute to this destination they hit a thunderstorm, which changed their flight path and the plane ended up crashing in the field where the park currently resides. Also on site is a Memorial Wall and other features. The park is located around 6 miles north of Sheridan off of Arkansas 5. The address is 1836 Grant County Road 51. Sheridan also has ties to the Civil War. In Arkansas, a portion of this war took place around 10 miles southwest of Sheridan at Jenkins’ Ferry. This was the final battle in the Red River Campaign, the Confederacy’s last stand in the state. The defeat there allowed Federal troops to escape and regroup at Little Rock. Jenkins’ Ferry Battleground State Park, along with Poison Spring and Marks’ Mill State Parks, make up the Red River Campaign National Historic Landmark. Speaking of history, while you are in town you can also stop by the Grant County Museum and Heritage Square, which has an extensive collection to look through. Inside are a wide range of artifacts connected to the area. You can learn about Littleton Meek Veazey, who gave land for the city of Sheridan in 1869; view relics from the Battle of Jenkins’ Ferry, one of the bloodiest skirmishes of the Civil War, see a large assemblage of World War II artifacts, and visit one of the nation’s largest displays of military vehicles, the Richard G. Harrison Military Vehicle Collection, which is located on the grounds. Zoie Clift is a travel writer for the Arkansas Department of Parks and Tourism.